For those of you looking for an easy way to compare the classes without having to be in-game, I have compiled a spread sheet of all the classes and their multipliers. 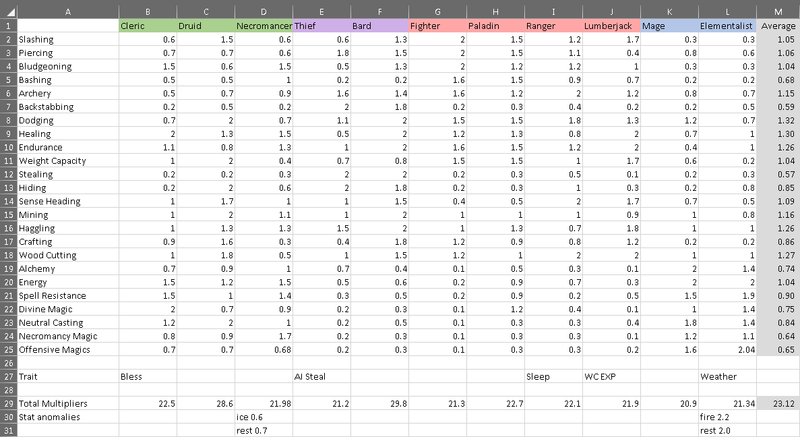 With this spreadsheet, you can see the overall "strength" of the class by seeing the total amount of "skill" it has. Basically what I've done, is added up all the multipliers together, class by class. This lets you compare how much "stronger" a class is, against another class. It also lists the special passive that a class may have. For example, Clerics have the Bless spell. This cannot be statistically evaluated, so it will not reflect on the score of the class. Elemental magics have been averaged into one single "Offensive magics" category. Some classes have a decimal, because there are small anomalies in the elemental distributions. Most classes have the same multiplier in all elements. I did it this way, because generally when spell casting, you'll only ever level up one element tree at once. I did it this way, because otherwise mage based classes would have pretty skewed stats. It's specified which classes have distribution anomalies. On the right most side, there are skill averages. This can let you see where a skill falls individually compared to other classes, if it's below the server wide average, or above it. If you have any suggestions for the spreadsheet, reply to this topic with them. The current spreadsheet will be posted as an image, since the forum doesn't support uploading the Excel files. The Druid and the Bard have the best skill set, since they have the most distributions into their skills, they are easily the strongest two classes in the game currently. The Druid sacrifices tankiness for decent casting ability, while the Bard is the opposite. The Bard has best stat line for a versatile melee character. It's better than the Thief at it's own role (with the exception of AI stealing). With balanced Slashing, and Piercing distributions, it doesn't matter which route you go. If you want to play the backstabbing game, play a Bard instead of a Thief. Later on, the Bard can switch to the Slasher with it's high Dodging multiplier. The Druid can switch to a caster type character much faster than a Bard can, however. The Druid is a very friendly class to start out in. With the proficiency in Slashing, you can use the KLS with ease, and you'd have very good access to transportation based spells, and can also use the Slasher as well as the Bard. The Cleric may currently be the strongest "end game" character. With access to a shield spell that no other class has, they will definitely be one of the tankiest classes available. The Mage/Elementalist is still a powerful class despite a low end score. You get very early access to spells, and with knowledge of the map, that's all you need to level up. In most cases, you can still level up faster than other classes. I don't recommend the Lumberjack, or the Thief at all. The Bard can do everything it can, but better.